If you have followed the first part of this guide, you should now have a better idea of which cargo bike is the right for you. Let’s now look at some more practical advice that will help you with making the final decision. If you are lucky enough to have an easy accessible garage or other secure place at home, skip this part. If your options are limited read on! The limitations are usually down to either size, access or both. Two wheelers are narrower (65 and 75 cm) than cargo trikes, however their turning range is wider. The width of cargo trikes generally ranges from 85 to 86 cm or wider. So, think carefully and get the measuring tape out if necessary. Where will it be kept when not in use? Can you lock it safely? Carrying a cargo bike over a set of stairs is not fun and is simply impossible for most. Going up a kerb to access a back garden however should be fine for most. The trick is to be able to pull it up as it is much easier than pushing it. Over half of our customers in London have no other options than to park outside their home. You should not be put off by the potential risks. It’s perfectly legal for a cargo bikes to park on the pavement. Just be mindful not to create an obstruction and ensure you are leaving enough space for wheelchair users and larger prams to use the pavement comfortably and safely. Invest in a good lock, ideally two, in addition to the frame lock that usually comes as standard with the cargo bike. Always lock the frame of your bike (not a wheel or rack) to a solid or fixed object such as lamp post (taller than 2m) or railing. If you want to avoid carrying a heavy lock at all times, consider buying two. Leave the heavy one for overnight parking at your regular parking spot and the lighter one for quick stops when out and about. 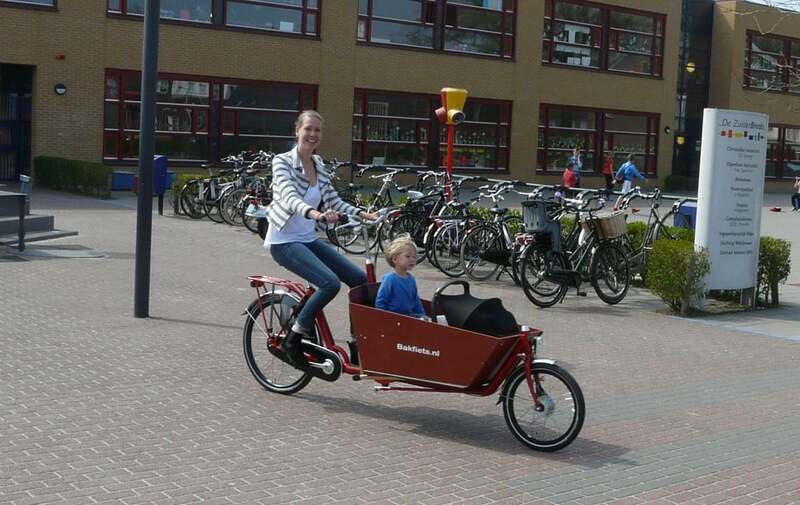 We recommend 90cm or longer for cargo bikes. D or U locks offer better safety-weight-cost ratio. Always choose a public spot, lit up over night or near your house where you can see it if possible. Read more about locking your cargo bike and what locks to get. Cargo bike are designed to be outside. However, overall covers can also be purchased should you want that extra protection. You could also contact your local council and ask if they could provide you with on street parking facility. There are suppliers who provide councils with solutions, usually for regular cycles, but just like car owners have the possibility to park their cars near their home, you should ask too. Your cargo bike is your family vehicle. Councils and suppliers are likely to adapt to demand so, you have the power to make these changes happen. There is a number of finance options available however most will cost you a bit more compared to the usual one off purchase. Different shops will work with different providers, so do your research. Cycle to work schemes can also help with the initial cost by spreading payments over many months. There are eligibility criteria as these schemes work via employers. This process is fairly straightforward and you should be set within a few days. Most of the schemes have a cap of £1000 however, Green Commute Initiative has not. We’ve covered both these topics in a previous post. If your budget is below £1500 you may also consider purchasing a second hand cargo bike. In such case we would advise to choose a well established brand. This should give you peace of mind over the quality and mean that the bike is made to last well over a decade if well maintained. This will also greatly improve your chances to get hold of spare parts and a mechanic with the knowledge and experience in repairing your bike. Ask your nearest cargo bike retailers if they have second hand or ex-demo models. If you go for an e-assist second hand cargo bike, bear in mind the cost of replacing the battery. A battery life span ranges from 2 to 4 years depending on usage. The cost of replacing a battery varies greatly. Once you have tasted life with a cargo bike, it becomes really tricky to do without, so you want to minimise the impact of being without it during regular maintenance or odd repairs. If at all possible choose a retailer nearest to you. It is the retailer that is responsible for handling any warranty issues and should also be carrying out your regular maintenance. Typical warranty is one year on mechanical parts/ accessories and 3-5 years on frames and boxes. To keep your bike in good, safe and roadworthy condition, have your bike fully serviced once a year. 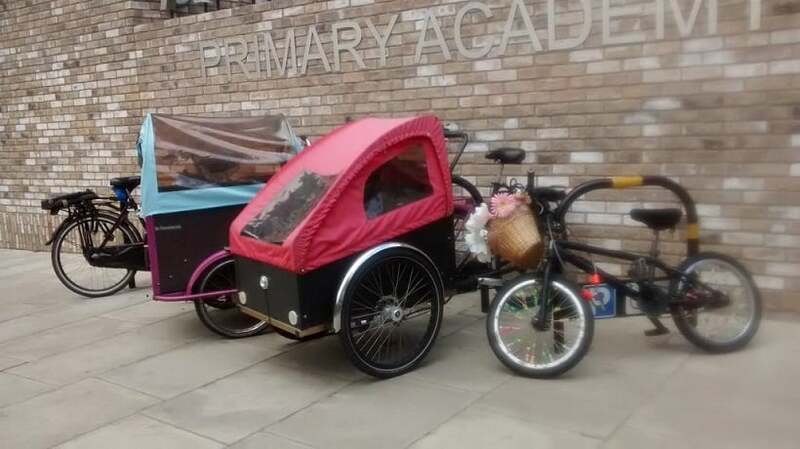 Running costs typically are around £70-£100 a year which is considerably less than a family car even though a cargo bike serves the same purpose. A well maintained cargo bike will retain about 50% of its value over a 4-5 years period. This, in our experience, is a typical lifespan of a cargo bike used by one family. A well known brand is easier to sell and will keeps its value. We are running workshops for cargo bike owners to enable you to deal with basic repairs yourself, saving you money and time. Find out more here. Not all insurers will be familiar with cargo bikes. Our recommendation is always to check with your home insurance first. You are likely to be asked for the bike to be locked to an immovable object as well as using approved locks if stored outside. Laka is an insurer who recently launched a cargobike specific insurance. The policy is tailored to riders like you with the risk shared among the cargobike community. It’s always worth checking if your local authority wouldn’t consider installing a communal lockable bike shelter if there are a few bicycle owners in your street. Bear in mind, a cargo bike is larger than a regular bike. Free inclusive third-party insurance and legal assistance are included with the London Cycling Campaign and British Cycling memberships. Well worth having for that peace of mind. We hope you find this guide helpful and would love to hear about your experience when looking for your cargo bike. Enjoy the cargo bike lifestyle!